Described by Philip Pullman as ‘the most important British writer of fantasy since Tolkien’, Alan Garner has enraptured generations of readers with novels like The Weirdstone of Brisingamen, The Moon of Gomrath, Elidor, The Owl Service, Red Shift, and The Stone Book Quartet. His huge knowledge and love of folklore have been shared in his collections of fairytales, Alan Garner’s Book of British Fairytales, A Bag of Moonshine andFairytales of Gold. His later novels, Strandloper, Thursbitch and Boneland continue and deepen his exploration of the language, folklore and history of the particular patch of Cheshire that is his own ‘boneland’. This extraordinary body of work has fascinated and inspired readers and writers alike for more than fifty years. 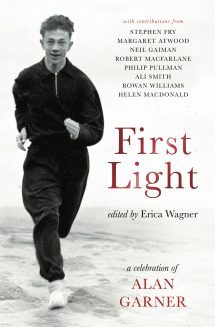 Now many of the writers, artists, archaeologists and historians he has inspired have joined together to celebrate his life and work in First Light. Whether a literary essay or a personal response to Alan’s work, a memory of the time they first read his work, or a story about the man himself, each piece is be a tribute to his far-reaching influence. The result is a beautiful and important book for anyone who cares about the power of story to enrich and transform. For more information and to order books: find First Light on Unbound’s website. The purpose of the storyteller is to relate the truth in a manner that is simple: to integrate without reduction; for it is rarely possible to declare the truth as it is, because the Universe presents itself as a Mystery. We have to find parables; we have to tell stories to unriddle the world.